Love is in the air…. yes, it’s almost Valentine’s Day! It’s time for chocolates, roses, the guy/gal of your dreams… and an incredible prize up for grabs for you loved-up kitties! 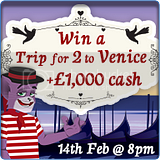 This Valentine’s Day, they’re offering the chance to win a Trip for Two to Venice + £1,000 spending money, the City of Luuurve! See you on Thursday 14th of Feb, Valentine’s Day @ 8pm – get ready to pack your bags! Play 90 ball Free card giveaway game. 1p/card daily at 8pm to win up to 9 FREE cards. Bingo heart pattern every night at 7pm in the Splish Splash room and win a FREE card. Play the daily Facebook quiz to grab FREE cards. Join the £1402 valentine's love celebration on 14.02! Play in the Love Celebration Room where cards will be on sale for just 50p each. Valentine’s Trip for 2 to Venice! This Valentine’s Day, they’re offering the chance to win a Trip for Two to Venice, the City of love! Be there Thursday 14th of Feb, Valentine’s Day @ 8pm – get ready to pack your bags! Bingo on the heart pattern every evening @ 8.30pm in the Red Hearts room and win a free card each time. Play in the fab Venice Tournament & get up to 39 free cards. Alternatively, you can pre-buy your £1 cards directly under Venice game in the Valentine’s tab. Love is in the air as Mecca has More Hearts for you this Valentine's Day! Instead of chocolates and flowers they're giving you a fabulous £5 bonus. All you have to do is deposit at least £5 and stake £25 on More Hearts between Monday 11th and Thursday 14th February to get your bonus. Love is all you need so let Mecca steal your heart! Roses are red, violets are blue, Mecca has £20k for you! That's right, this Valentine's Day they have £20,000 that must be won. Come and play in the Gold Rush and Gold Rush Premium rooms from 5pm on Thursday 14th February to try and make your Valentine's Day extra special. This jackpot has to be won so the call rate will start at 31 at 5pm and increase by 2 an hour until 1am! Don't worry if you're not a full house winner though, this is a community jackpot so everyone who has bought tickets to the winning game will win a share of the prize! Be Mecca's Valentine this year! OMG time is flying by. I'm still stuck in the gifting rooms started before Christmas! Here's my Valentines Day Card idea: "B-my9 Bingo Valentino! Collect 10 or more hearts and you can trade them in for some big BB's!!! Join them in the Valentine's Bingo Room for the Break Bertha's Heart chat special!! Enjoy 3 days of this chat special from Monday February 4th until Wednesday February 6th from 8am - 12am ET! Please remember to check the rules of this game! Bertha will pick up your tab for the dinner! You can get your entry into the drawing for Dinner for Two by a simply bingo on the WINE GLASS, CANDLES, DIAMOND RING AND CUPIDS ARROW patterns. Watch for the VALENTINE HEART pattern to play with a $75 minimum guaranteed cash prize with a $1,000 JACKPOT! Polo Bingo is getting all loved up with a lovely £5,000 Bingo jackpot! Tickets are available to pre-buy now! The "In the Name of Love" promotion runs from 1st February until 12th February, with the main game playing on Valentine’s Day at 10pm. Cards are available to buy from the Diamond Club for 10 Diamonds each or in the Lobby for £2 each. There are also several ways to earn free tickets. The winner will receive a Romantic Spa Break worth £600! One lucky winner will be chosen at random and receive a £100 for dinner. You pick the restaurant and Zingo will take care of the rest! 20 FREE Spins on Dr Lovemore Slot! Feel the love while you are spinning on Valentine's Day February 14th! To take advantage of this great offer simply enter code DRLOVEMORE14 before making a deposit and a £2 bonus will be added to your account to spin! This Valentine's Day win an amazing spa prize! Each deposit you make awards bonus cards to the upcoming Special Games which includes the Trip to Bahamas Giveaway and the Valentine's Day at the Spa game! They are showing love to the Bingo Community this month by offering the chance to win a share of a second Full House you play bingo in the Sapphire Room between Friday 1st - Thursday 14th February. How it works is each promotional day, between 7am - 11pm the resident Chat Hosts will pick 2 players to share a Second Full House after the game has been won! Canadian Dollar Bingo has over $25,000 in prizes up for grabs in the Be My Secret Valentine promotion. from February 5th – February 14th 2013. “BE MY SECRET VALENTINE” patterns as possible. Every player that completes the phrase will win $250.00 CASH! an entry into our Grand Prize Draw for $1,000.00 CASH!! !